Jeremy Andriano puts down the controller. The first time I saw Gloomhaven, I was at a videogame convention. Its giant box really stood out in the little section set aside for tabletop games. The guy working the booth said, “It’s basically an analog videogame.” Its creator, Isaac Childres, once wrote, “I wanted to create a simple dungeon crawler that could be played without a game master but still feel like a free and open world with campaign play.” For a boardgame, Gloomhaven does promise some distinctly videogame-esque features: the ability to be played single player or as a cooperative group, complex enemy AI, upgradable character classes, and a persistent world that changes based on your actions. Having always opted for the automated convenience of videogames, the thought of venturing into a more hands-on kind of space intrigued me. 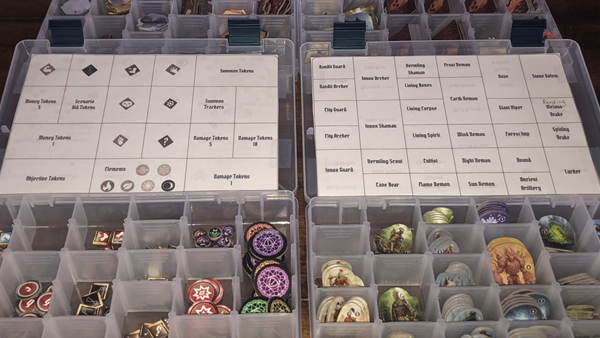 Undertaking Gloomhaven offered a unique opportunity to examine the relationship between tabletop games and their digital cousins, and to highlight the elements that distinguish one from the other. My approach was that of a curious tourist. Imagine someone who enjoys the occasional nature hike suddenly deciding to climb a mountain, or a novice snorkeller attempting to dive the Great Barrier Reef. I had no idea what I was in for. When I peeled open Gloomhaven for the first time, I was immediately overwhelmed. The box was packed so tightly that it hissed as the top slid off. The colorful paper and cardboard, the intriguing drawings, the weird symbols—somehow the ink and glossy paper even smelled mysterious. I started with the rulebook, dutifully reading, getting the lay of the land. Of course, most of it was going over my head, but I was just starting out, right? Surely it would make more sense soon. But as I dug deeper into the details, it just got more confusing. The standard modifier deck? Not to be confused with the character specific modifiers, which were also separate from the Bless and Curse modifiers? The manual dropped me in the deep end and told me to start paddling. Admitting I was making little progress with the rules, I decided to change course. 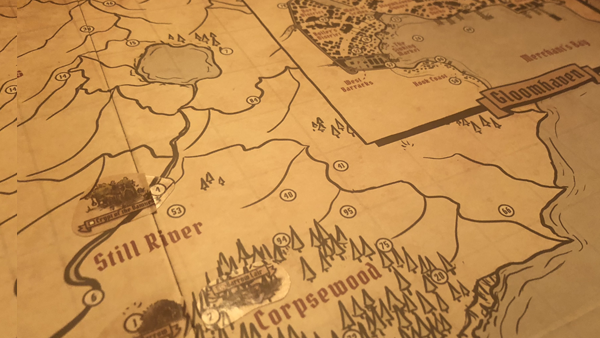 Perhaps by spending some time breaking out the hundreds of small cardboard pieces and larger map tiles, I would gain a better sense of how to proceed. Maybe after organizing the pieces, the rulebook wouldn’t be so daunting. But before I knew it, my rather large table space was completely covered, cluttered, and confounding. Cardboard standups of Shambling Undead and Bandit Archers were spilling over onto piles of Gold Pieces and little markers displaying a skull and crossbones. I was separating boulders from bushes and then realized they were the front and back of the same terrain tiles. Have I mentioned there are 13 different decks of cards? Mild panic set in. A few hours had gone by and all I’d done so far was make a mess in my dining room. I lowered my expectations; “I’ll just play a few rounds and get a feel for the game” became more like “I hope I can figure out a way to get this all back into the box”. Without knowing much about the pieces, I organized them as best I could and started placing them in plastic bags. I rubber-banded each deck of cards. I put it all away. Every game has to have rules. Rule sets may be short, like Pac-Man’s ‘eat-dots-dodge-ghosts,’ or they can be as long as the Players’ Handbooks and Dungeon Masters’ Guides of Advanced Dungeons & Dragons. The limits they impose are the defining boundaries of any game. Modern videogames can automate the rulebook in the form of a tutorial. A well-integrated tutorial is an expected component of any new release. Yet, while Gloomhaven will prove to be successful at many things, its online video tutorials are not one of them. Complicated tabletop role-playing games are managed by a game master, who keeps track of statistics and systems—all the nuts and bolts—so the players can sit back and imagine the events. While Gloomhaven is playable without a game master, at least one player has to learn the rules. Because I was playing alone, that someone was going to have to be me. I returned to the gates of Gloomhaven. There was no tutorial area waiting for me. It was like moving through a dark room, with my hands out, getting a feel for the surroundings. While I tried to get my bearings, I reflected on a second unifying feature typically automated, or narrated by a game master: setting. Most boardgames don’t require a deep story or setting; we don’t ask why they were settling Catan or how those Hippos got so Hungry. However, videogame and tabletop role-playing game settings are limited only by the ambitions and abilities of the developers or game masters. Gloomhaven attempts to build a vast, detailed world with nothing but text and illustration. I was getting my first glimpse of the people, places, and happenings it had in store for me. There are six character classes available at the outset of the campaign. They each have their own sculpted figurine, and a closed packet, marked only by a symbol so the contents remain secret. They contain items unique to that class: decks of ability and modifier cards, a pad of character sheets, a cardboard mat with some statistics, an illustration, and a description. Going through the packets felt like starting a videogame RPG; familiar territory. I was examining my initial options, studying skill trees, planning progression. Gloomhaven has the standard Fighter-Mage-Thief archetypes, but they are accompanied by less intuitive fare. The Mindthief is a rat-human hybrid whose psychic abilities can possess allies and enemies alike, or summon hordes of vermin to do his bidding. The Tinkerer is a gadgeteer with access to steampunk-style flamethrowers and grappling hooks. A dozen more packets, each closed with a seal, contain characters waiting to be unlocked over the course of your travels. With nothing more than a few sealed envelopes, Gloomhaven tempted me with discoveries to be made, like it was a place to be explored. I looked forward to one day opening those envelopes the same way I did with reaching new areas in a videogame. With my party created, I opened the scenario book and read the introductory narrative. I read it out loud, trying to create some ambiance, some magic. We were hired by a merchant, a red-skinned woman with a tail, to recover some merchandise from a band of thieves holed up in a tomb up the road from Gloomhaven. I was directed to draw cards, one City Event and one Road Event. I went rummaging in the box for those decks. What did they look like again? Wait… Didn’t it say somewhere in the rules that I was supposed to separate a certain number of those event cards out? That the others would be added back to the deck once certain achievements had been accomplished? I rifled through the rulebook. Where had I seen that…? The spell was temporarily broken. Still learning the rules, I was again reminded of all of the hard-working game masters and videogame designers in the world, so often taken for granted. They simultaneously manage so many systems so we can enjoy the illusion of a working fantasy world. Once I located the decks themselves and the accompanying instructions, I was rewarded with another familiar RPG element. These cards are Gloomhaven’s version of random NPC encounters. While a videogame may simply present you with a cut-scene and some dialogue options, the analog nature of a boardgame is more do-it-yourself. Travelling to and from town requires your party to draw these random event cards, describing a situation and usually offering several options on how to proceed. The back of the card describes the outcomes of the different choices. Like a well written videogame or the tales of a crafty game master, some of the results are unexpected. One card I encountered had an act of goodwill negated by the fact that our party had a Vermling Mindthief; the person we were trying to help turned out to have an intense hatred for the rat-like Vermling race and attacked us. 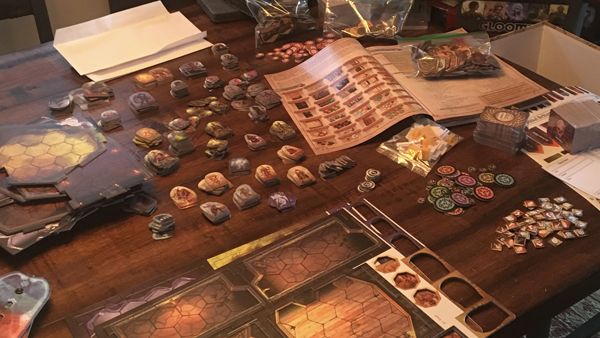 While I was enjoying learning about the setting, I was still struggling with Gloomhaven’s numerous physical components. The rest of that play session was spent piecing together the map and monster standees for the first scenario. It took a long time to find everything I needed, digging through plastic bags with loose piles of illustrated cardboard. 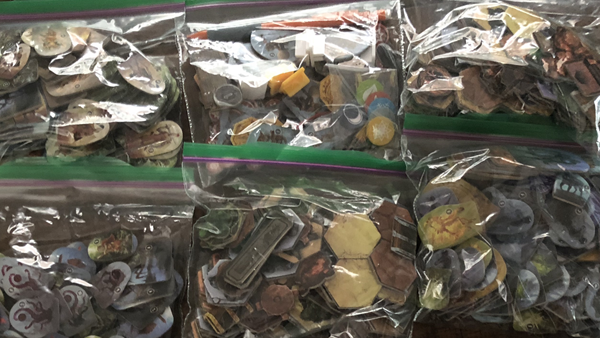 I looked at my sad little collection of baggies, noting that the one I had set aside for damage tokens, status effects, money tokens, and summons was far too disorganized to be serviceable. By the time I had the pieces all set up, I was out of time and I had to take it all down. I packed my characters into their individual little boxes. I labelled a baggie ‘Current Game’, then I threw all the monster, trap, and treasure tiles in it. At least I had formed my party. I’d achieved that much. My digital gaming experience had not prepared me for the very analog realities of storing and organizing hundreds of pieces. 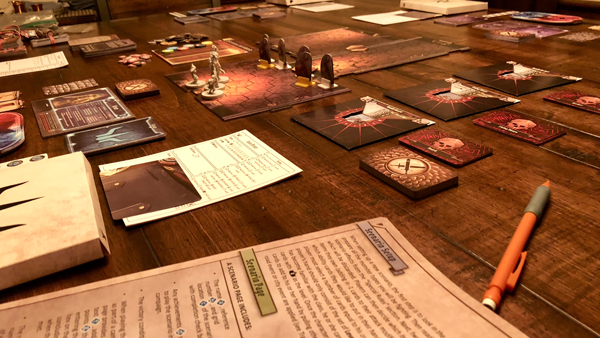 Gloomhaven cannot simply be ‘booted up,’ and I could not spend hours setting up every time I wanted to play. There had to be a solution to this conundrum. That’s why the Internet is a wonderful thing. A few weeks ago, I had never heard of boardgamegeek.com. Sure, in a general way I knew there were hobbyist sites dedicated to tabletop games, just like I have my videogame sites I check daily. Now I owe a great debt to Ryan H, who posted this on the Gloomhaven forum: Y.A.S.S. (Yet Another Storage Solution). The information there is essential. Within minutes, I had ordered the containers recommended by Ryan. A few days later I had them. Properly outfitted, I continued my journey. I knew I wasn’t going to be playing this time. I spent several hours sorting and filing tiles. Intricate illustrations of demons, traps, terrain, and treasure each got their own home in labelled boxes. Weirdly enough, it was through this organization and busy work that Gloomhaven really endeared itself to me. Whether I had initially realized it or not, this was the obsessive nerdery I had been hoping Gloomhaven would provide. If I only wanted to play a game, I had hundreds of videogames waiting for my attention, all with no more effort than the push of a button. This felt fresh, new, exciting. I was an alchemist, distilling a powerful elixir down to its component parts. When I was finished, I would know how to brew it myself. I was learning a ritual. I stormed the gates. It didn’t end well for my band of unsavory outcasts, but I had a blast. There’s something to be said for sticking to one’s principles when playing a boardgame alone. I could have cheated. Hell, with the band of mercenaries I was role playing as, it would have been in character to cheat. But I’m glad I didn’t. I failed the first scenario of Gloomhaven twice, each session taking a few hours, before finally succeeding. It’s amazing how well the rules of the game, the different decks, the systems on top of systems—they all work together to make you feel like you’re actually playing against something. All games need rules, and most games benefit from a setting, some sort of story or narrative. They also need an objective. Videogames can be competitive, or allow solo and cooperative play by automating enemies and objectives. Likewise, boardgames are typically competitive, challenging you to defeat the other players. Gloomhaven combines a set of behaviour priorities with a series of shuffled decks of cards, creating an automated, but unpredictable, enemy system. Sometimes the objective is to defeat all of the enemies. Sometimes it’s more nuanced, like making sure a non-player character survives or looting a specific treasure chest. The minute-to-minute gameplay really does start to feel like a videogame. Round by round, Gloomhaven plays out like a turn-based strategy game. Characters decide which actions and movements they will make. Then the enemy’s actions are decided by a set behaviour and modified by random cards. Turn order, however, is revealed last. You might select actions that you’re sure will allow your Brute to go first, clearing out that cluster of Bandit Archers. Then those same Archers might draw a miraculous 7 for initiative when you played an 11. They go first, your Brute goes down. Gloomhaven can be infuriating. It wants you to feel helpless, like your every effort is last-ditch. You’ll come up with a strategy you’re sure can’t lose, and a few random numbers later, you’re muttering to an empty table. Well that certainly could have gone better… That was unfortunate… You’ve got to be kidding me… There’s a beauty to how insidious the systems are. Gloomhaven offers unique challenges. Some that, by their very nature, would never exist in a digital format, but cannot be avoided in a boardgame this ambitious. I had to wrestle with the actual pieces in the box. Then it was just managing the systems themselves; I’d forget to remove a status effect that had expired or I’d lose track of a character’s hit points. Instead of playing as a single character, I was attempting a party of four characters. Couple that with having to determine the actions and movements of the monsters, as dictated by the rules, every turn. For a tabletop novice like myself, the learning curve was steep. It was worth it. It took dozens of hours, but it became easier, dare I say, automated. It was sheer muscle memory at this point. Manipulating the physical elements and navigating the rules no longer feel like barriers. Like holding a game controller, I’m in direct contact with my objectives. And my opposition. The world itself. Jeremy Andriano is a writer living in Toronto, Ontario. He occasionally thinks out loud at nerdsofacertainage.com. Find him on Twitter @jeremyjandriano.